Rocky Mountain Ride in Late August.....Any ideas? This is my tentative route on the back line, out and back. If anyone knows something I " GOTTA DO " In the area here let me know. I'm still toying with the GPS routes to put into the riderGPS, so nothing is in stone yet. If I got it on the bucket list I'll reply as the map does not show much specifics since it's kind of zoomed out. It'll be 12 days total with a week break half way in CODY WY. 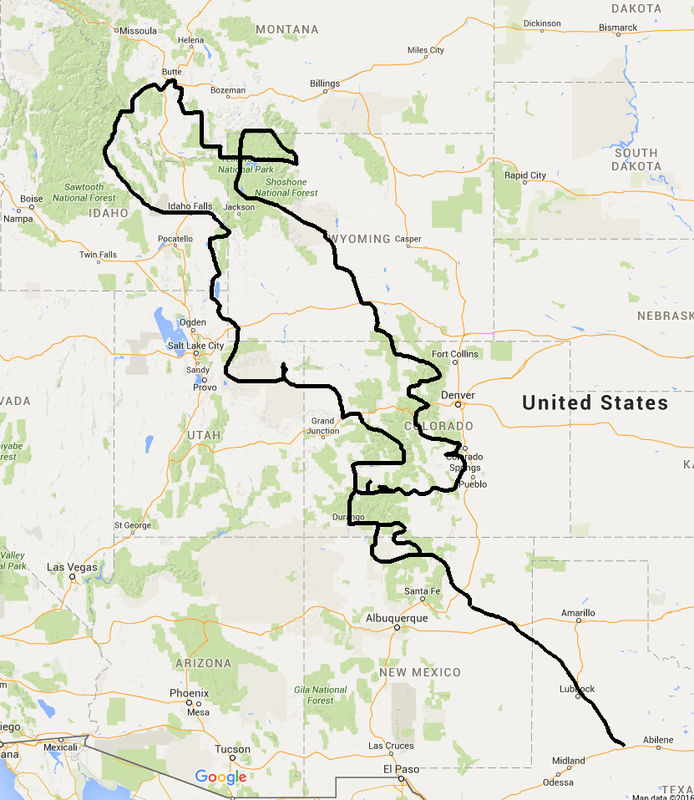 Re: Rocky Mountain Ride in Late August.....Any ideas? Did this in 1998 on my new C10. Awesome. I am riding some of those roads. But I'll be taking a closer look at those routes and making a couple adjustments . I am doing 212 ,beartooth pass over into Montana. But I'm doing that mid-week with the wife so it does not show that as part of my depart/return route. make sure you do not miss the chief joseph highway and beartooth pass out of cody. When Joe? Try to swing south in UT to St George. Some awesome routes there to play in. Planning a SW regional In Cedar City UT in Sept. It takes a whole day just to get out of TX. Laramie River Road (Route 103) in Northern CO east of Walden (take route 14/Poudre Canyon Road, which goes to Fort Collins) - it's an incredible ride up through a quiet valley that's all national park. Hard-pack dirt road, takes about an hour to ride, max speed 35. Brings you out in Woods Landing/Jelm, WY, near Sheep Mountain (with more riding up there). You'll also be near Trail Ridge Road up in the Estes Park area. Don't miss either one - Estes is a very nice mountain town (we're staying up there this weekend in a cabin at the YMCA "camp"). Trail Ridge is the highest paved road in NA, opens late May/Early June, goes from Estes west to Granby (highway 34). HUGE SCORE with the royal gorge bridge!! I am traveling down 50 from pikes peak and would have driven right by there. Not sure if I would have noticed or not. But that's now on the list. Is that bridge open to vehicles? Or do I gotta backtrack to 50? Is the ALPINE LOOP paved the whole way? If not I'll have to skip it. Or, is there a specific route I can take that is paved if you are familiar? 103 looks beautiful but I'm sticking to paved roads only. It's rain or shine for me on this trip so a rain on this road would be pretty messy Unless you've been there before in the rain and know it does not go to MUD. TRAIL RIDGE ROAD is on my list! Highway 34. Now on this section, im coming in from the north from Walden, through 14 east, down 27 south through masonville, then hook it 34 west to 36, and back to 34 west, down into Granby. From there down 40, hit IH70 west briefly, down to 6, and 9 down to fairplay for the night. Huge thanks or I would have missed Royal Gorge. 27 from Highway 14 to Masonville is my favorite ride on the planet. Three years ago the flood wiped out the road. They just reopened it one year ago. Fresh pavement, tons of twisties, ups, downs, lefts, rights, fabulous road. At the summit is the Stove Prairie School, oldest continuously operating school in Colorado, since the start of the last century. If humanly possible, do this on a weekday. You will likely be alone. Plus Highway 34 (just South of Masonville heading up to Estes Park and Trail Ridge) is slammed on the weekends. A gorgeous ride, but wall to wall cars chokes most of the joy out of it. 27 from Highway 14 to 2Masonville is my favorite ride on the planet. Three years ago the flood wiped out the road. They just reopened it one year ago. Fresh pavement, tons of twisties, ups, downs, lefts, rights, fabulous road. At the summit is the Stove Prairie School, oldest continuously operating school in Colorado, since the start of the last century. If humanly possible, do this on a weekday. You will likely be alone. Plus Highway 34 (just South of Masonville heading up to Estes Park and Trail Ridge) is slammed on the weekends. A gorgeous ride, but wall to wall cars chokes most of the joy out of it. 27 south to Masonville is on my list, as well as passing through Estes Park via 34 to 36. My depart day is Sunday, so I will be going through 27 on monday so hopefully traffic is light for me on 27. Highway 7 is a great exit from Estes. Much more fun when picking up the peak to peak to head further south. So-far, my route out of Estes Park is via 34 west, down into Granby down 40 to IH70 and into the silverthorne area to catch 9, to fairplay where I will be staying the night. This is about a 400 mile day and 9 hours not including stops for gas and pictures. Is 7 south to 72 into black hawk a better route? Trail Ridge is the highest paved road in NA, opens late May/Early June, goes from Estes west to Granby (highway 34). Highest continuous paved road in the US. The highest paved road (also in Colorado) goes to the top of Mt. Evans, just west of Denver. Both roads highly recommended. "Take a whole day just to get out of Texas" - yes, but it's soooo worth it! You'd be back-tracking from Grandby if you chose to hit 7/72. I'd stick with 70 west to the Loveland Pass exit. Go over the pass and then around the south side of Dillon reservoir which will join 9 just north of Breck. 9 over Hoosier Pass between Breck and Alma will be fun. Yeah know the feeling. But Texas will likely always be home unless the politicians make it another failed BROKE state! Two or three years ago, me and the GF spent night 1 in Estes, night 2 in Breck, and then on to home. Took the Estes to Fairplay portion of the route you've included. She rides and had never done any passes. You'll go over Trail Ridge, Berthoud, Loveland, and Hoosier passes. We had a grand time. Lots of scenery and many, many fun curves. Good to hear. It LOOKS good based on the google street views so far. The next day is Pikes peak and then the gorge off of 50. Not sure if you're looking to enjoy the Black Canyon of the Gunnison after your overnight in Gunnison - but if not, I'd suggest one hour more to Montrose (west) for a much better selection of hotels. Then, it's just a 35 minute ride into Ouray for your start-of-day Million Dollar Highway. And going south is the FUN direction! If you stuck on Gunnison - it's a cool town. Good eats and plenty of decent hotels (presuming you're staying in hotels...). Oh, and there's coeds all over the place....though maybe not so much in the summer. Oh almost forgot, I'm married, happily so no need for co-eds unless they want their pic taken for my model mayhem portfolio! Off I go in the AM! ...thanks for the suggestions from the group. I would have missed several must-see roads. So close to Glacier and missing that? But it sounds like time has you in a bind so to speak. "It is easier to seek forgiveness than to ask for permission"
Glacier national park? Yeah no time for that this time. Page created in 0.715 seconds with 25 queries.